We know that shoppers around the UK have been loving Holly Willoughby's new Marks & Spencer collection - and it seems that the presenter can also count Lorraine Kelly as a fan! On an episode of her morning show this week, the 58-year-old opted to wear a skirt from Holly’s winter ‘Must-Have’ collection with the retailer, in a very festive shade. Lorraine wore the ‘dark claret’ – or plum – version of Holly’s faux leather pleated mini skirt, paired with a matching purple knit jumper from Zara and a pair of black heels. The presenter looked as Christmassy as she did stylish in the outfit, which fans of hers also appeared to love. 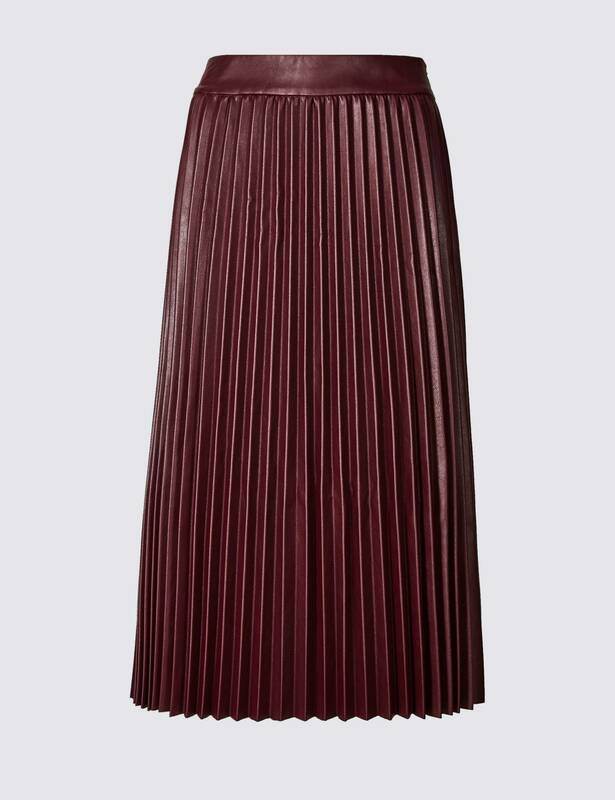 One of her viewers wrote, ‘The pleated skirt looks lovely on Lorraine’. While another commented, ‘I loved the colour and the dress. I thought she suited the style’. However, some other viewers were less than impressed, suggesting the skirt didn’t quite fit with the star’s figure. But we reckon she looks gorgeous! And it looks as though Lorraine isn’t the only fan of the M&S skirt. It’s proving to be a very popular choice on their website, having already sold out in the purple colour in almost all sizes. There are still three sizes left in stock – a 14, 16 and a 20. So if you want these, you’ll need to be quick. But never fear if the purple skirt isn’t available in your size anymore. It also comes in three further colours, which are equally as stylish. If you fancy being bold, you can pick it up in a super-festive dark green. Or, if you prefer more neutral tones, the skirt is also still on sale in most sizes in a dark tan and a black. All versions of the skirt are also available for the pretty affordable price of £39.50. Although we’re sure you don’t need much convincing to treat yourself to the skirt, Holly Willoughby herself has noted that it’s a brilliant piece to take you from day to night during the winter period. And we couldn’t agree more. Wear it with ankle boots or even trainers for work, or more relaxed events during the day, or style it up with a pair of heels for an evening out. Customers who have already got their hands on the skirt have also been singing its praises. On the M&S website, one wrote, ‘Gorgeous colour, perfect fit ( I’m a ‘small ‘ 14) and the material is v soft and ‘realistic ‘ leather.’. And another said, ‘Fabulous the skirt, I am totally in love with this, and very versatile’. So will you be buying one?